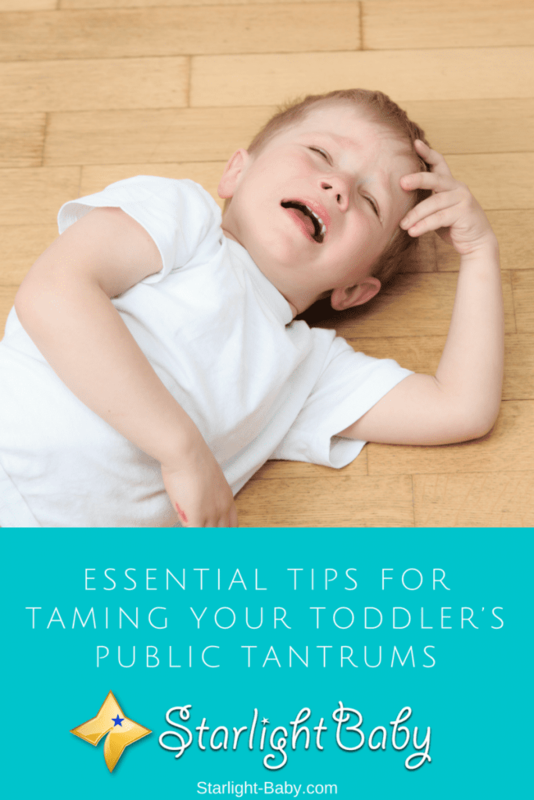 The good news is, there are ways you can tame your toddler’s public tantrums and below you’ll discover some of the most effective, tried and tested methods. If the tantrum is taking place in a pretty crowded area, the first thing you can do is move you and your toddler to a quieter area. This will ease your own mind as you’ll be less focused on the people around you and you’ll be in a much calmer place emotionally to deal with the situation. It’s important to note here that if you do move them, don’t drag or angrily pull them to one side. The anger and tension will be picked up on by your toddler and it’s going to make the tantrum a lot worse, rather than better. Instead, remain calm (easier said than done I know! ), take them by the hand or pick them up if they refuse to move, and walk slowly over to the quieter area. You’ll often find, quieter areas also calm your toddler a lot quicker. For some reason, public places do tend to be a trigger for toddlers when it comes to emotional outbursts. Sometimes the release via a tearful tantrum is exactly what they need to release the emotional build-up. It’s a natural response and often makes the rest of the outing a lot easier once they’ve got it out of their system. This is probably hands down the hardest tip to follow. When you’re faced with a screaming child after you’ve had very little sleep, a stressful time trying to just get out of the house, and now what feels like a million strangers judging you, it’s enough to push any parent over the edge! However, as mentioned above, anger will only ignite the situation, rather than diffuse it. OK, so it’s hard to ignore your screaming child and continue doing what you were doing. So, we’re not suggesting you do that here. What we are suggesting, is once you’ve taken your toddler to a quieter area, leave them to cry it out and don’t feed them attention until they stop crying, if reasoning with them doesn’t work. Sometimes, this may be the only thing that works. Take out a book, your phone or anything else you can focus on. Sure, you might not be able to actually read the book, but it gives a pretty clear message to your toddler – their tantrum isn’t working. By seeing you’re focusing on something else, they will stop eventually and that’s when you can pay attention to them again. This tip is particularly effective for toddlers that are being intentionally defiant – we aren’t suggesting this be used every time. It may take a few attempts on different outings for this tip to work. However, gradually your little one will start to realize that public tantrums don’t get them what they want. If the tantrum is a result of you saying no to something your toddler wants, it’s really important not to give in. If you’re tired, it’s been a particularly hard day, or you simply want to stamp out the tantrum as quickly as possible, it can be tempting to just give them what they asked for. After all, surely it’s worth the peace and quiet? Unfortunately, while it may temporarily help ease the problem, you’ll actually be creating a more long-term, worse problem if you cave in. Why? Because your toddler has now learnt that throwing a tantrum when you say no, gets them exactly what they want. So, the next time you’re out and you say no to your toddler, they’ll know exactly what to do. Never give in just to make the situation temporarily easier. Sometimes, no matter what you do, you’re not going to be able to stop that tantrum in its tracks. So, in this situation, it’s worthwhile having some pre-prepared responses ready to go. When your toddler is mid-tantrum, you can guarantee somebody is going to say something. Whether it be a simple “oh dear, he/she isn’t very happy this morning!” or “Have you tried doing this?” – it can be really frustrating, embarrassing and difficult to think of a suitable response right there in the moment. So, to combat this, you can have a list of responses in your head ready such as “We appear to be having a few technical difficulties”, or “We’re taking it in turns, once he’s finished it’s my turn”. Adding a little humor to the situation, while also showing you are in control (even if it looks like you aren’t), will usually be enough to stop any further comments. Overall, public tantrums aren’t easy to deal with and it is extremely difficult sometimes to stay calm and collected. However, if you follow the above tips, you’re more likely to see a positive result. Just remember – not all tantrums can be prevented or eliminated quickly. Just repeat to yourself in your head, “this isn’t going to last forever, it will be over soon”. Having your own calming mantra to repeat back to yourself can work wonders! Have any tips or stories of your own to share? We’d love to hear them! Ah, the good old public tantrum. I think that we have all experienced this before… or at least witnessed one. I agree with you that us, the mothers shouldn’t worry when this happens because the rest of the people will definitely sympathize with us and won’t be quick to judge. I often see the children throwing tantrums in our local grocery shop. They want a particular item or a chocolate, the parents say no and there we go! The kid starts to scream and rolling on the floor. Most parents panic and start giving in right away. But that’s the wrong thing to do. When they are throwing a tantrum, the attention is all that they want. Be strong. Don’t break because your child has to learn that he/she can’t manipulate you like that. You’re right, Jane. Parents should learn to resist the urge of giving in to a child’s whim when he/she throws a tantrum. When parents ignore a tantrum, it teaches a child that he/she will not get what he/she wants by throwing a tantrum, otherwise, the child could, indeed manipulate his/her parents and would keep throwing a tantrum to get what he/she wants. It’s embarrassing when a child throws a tantrum in public, but sometimes I can’t help but be annoyed when I see kids do it and the parents can’t seem to do anything about it. I have five kids and none of them ever threw a tantrum in public because when they showed a tendency to throw a tantrum, I addressed it right away. I told them they will get a spanking if they do so they never did, although I never really did spank them. The temper tantrums: Our feared enemy. Not only our little one starts to test our patience, but people all around us do as well. It’s quite infuriating when some bystanders judge us for having a toddler throw a tantrum in public, as if that was a proof of bad parenthood. I will definitely try to have some replies ready if such a thing happens again, but it tends to get me on my nerves far more than my little girl’s tantrums. Thankfully she’s generally well-behaved, but toddlers are toddlers and they’re unpredictable! Sometimes it’s really hard not to give in, but we must have a strong willpower, lest we end up teaching our kids that crying and being unruly is a good way to get what they want. So true, RoseLady. Parents should have a strong will power to resist the urge of giving in because as you’ve said, crying and being unruly is not the right way for a child to get what he/she wants. Giving in will definitely encourage the bad behavior. I found this article very useful and informative. I have a three months old baby and he is too young to throw intentional tantrums. However, I have seen toddlers throwing tantrums in public and in point in my life, I will also have to deal with this. This article contains great ideas, for moving to the less crowded area, not feeding them attention, resisting the urge to scold them etc. In my observation, the toddlers throw more tantrums if the audience is big. By throwing tantrums they are trying to grab people’s attention and forcing parents to their whims. Exactly, vinaya — the bigger the audience, the greater the tantrum. It’s a bad behavior that feeds on attention so if we take away the attention, they have no choice but to stop what they’re doing because it tells them that it is not working. I believe it’s the same thing when someone teases or bugs you. I always tell my kids to just ignore someone who bugs them and that child or person will stop because his/her acts are getting no response. You’re right on this. I have seen many parents beat their little kids in public as a result of tantrums and the more they do so, the more onlookers will ask them to please stop. So, taking the kid to a quiet place is one step, as you suggested that parents should take. Another point I think parents should understand is not to give in to every request of the child, by not giving in, it will send a message to the child that they won’t get everything they need. Most parents out of not wanting the child to cry always yield in and that is not good in my opinion. I mean it is okay to let them cry and dry their tears so that they will learn not to cry next time at everything that happens. Your article is quite good. keep up the good work. There is this common saying that kids are kids, that they don’t know what they are doing. But I’m so sorry to disagree with this assertion because kids of nowadays definitely know what they are doing 100% without any shadow of a doubt. So therefore, I completely agree with the point that says don’t give in to their requests when they are going on a tantrum spree. Just ignore them and give less attention to it, once they realize that you don’t care about what they are doing, they would just calm down. My child has lived the baby stage and now he is officially a toddler. Since we don’t take our baby outdoors too much, so far the boy has not created any problems for us. However, based on his indoor behavior, we can guess that he will show tantrums in public. The boy wants to get away with everything he desires, and as a parent it is our responsibility to stop him doing this, We will only allow what is acceptable and stop what is unacceptable. This article is a great eye-opener.